In addition to our award-winning playgrounds, the City of Rome is filled with a wide variety of parks to provide citizens and visitors with the perfect spots to take a walk, enjoy nature or just relax. City Hall/Liberty Plaza, located behind City Hall, 198 N. Washington St.
Veterans Park (formerly known as West Park) is located in the 200 block of North James Street. With its twin park, Gansevoort Park, it forms a unique and important ceremonial space along the North James Street corridor. Both parks are special use parks designed as memorials, and have historical significance within the community. Each park, which is entirely passive in usage, is designed around a central monument with diagonal walkways. The parks also make use of this design to incorporate a series of benches and litter receptacles. These parks are open from dawn to dusk. Both parks have significant street frontage. Although there is no programmed recreational use of these parks—there are periodic services held at the parks as well as usage during Honor America Days as well as the annual Holiday Tree Lighting Ceremony. Sidewalks and lighting have been replaced and are in good condition. A tree inventory has been conducted, with some diseased trees removed and new trees planted. In addition, the Old City Fountain was placed in the park in 2003 – when it was returned to downtown from the Erie Canal Village. Veterans Memorial Park also features several flagpoles that display the flags of the major branches of the armed services: Army, Navy, Air Force, Marines and Coast Guard as well as the American Flag and a flag for soldiers who were POW/MIAs. 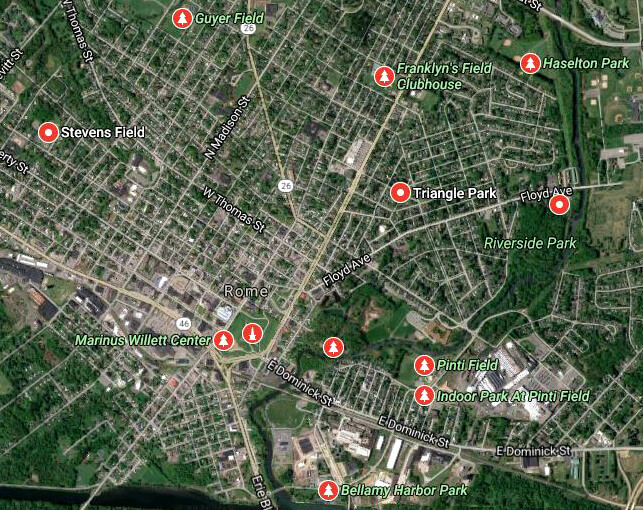 Vogel Park is located in the middle of the North George Street traffic circle in North Rome. This park was created in 1919 for use as green space and for passive use. The location of the park is in the middle of Rome’s Historic District and the park itself is surrounded by numerous examples of outstanding architecture. The site’s only development is the landscaping design, including the paved walkway down the middle of the park and the decorative lighting down both the interior of the park as well as the lights that encircle the parks exterior. A series of memorial benches are located at the ends of the walkway. The walking path down the middle of the park is in excellent condition, having been replaced in 2003. The tree stock is aging; however, a tree restoration plan is in place and more than two dozen new trees have been planted to someday replace the majestic trees at the center of the park. In the 1920s through 1940s, the park was famous for its gorgeous lilac groves, and the park was a common location for weddings and wedding photos. Future plans for the park include the planting of a memorial garden as well as a reintroduction of the historic lilac groves. Gansevoort Park (formerly known as East Park) is located in the 200 block of North James Street. With its twin park, Veterans Park, it forms a unique and important ceremonial space along the North James Street corridor. Both parks are special use parks, designed as memorials and have historical significance within the community. The Veterans Memorial Park area also features several flagpoles that display the flags of the major branches of the armed services: Army, Navy, Air Force, Marines and Coast Guard as well as the American Flag and a flag for soldiers who were POW/MIAs. Wiggins Park is a half-acre park located at the intersection of West Thomas Street, Lee Street and West Bloomfield Street. The site is passive, with landscaping and benches, primarily because of a highly active residents group. In 2007, neighbors of the park started a petition to have lighting upgrades to the facility based on its location in a high traffic area and an important city green space. The residents also sought landscaping improvements designed to promote more visibility into and through the park, which are consistent with CPTED standards. The installation of these lights is anticipated in the fall of 2009 or the spring of 2010. During the installation of the lights, the park will also undergo some modest cosmetic improvements, including the development of a shade garden in the section of the park near Wood Creek. Additionally, some overgrown shrubbery will be removed and relocated to other facilities. Bellamy Harbor Park is a regional/community park located off East Whitesboro Street in East Rome. It is not owned by the City of Rome but rather by the New York State Canal Corporation. The park is designed to serve the population of Rome as well as travelers along the Barge (Erie Canal). The park has frontage along East Whitesboro Street as well as a high degree of visibility from two of Rome’s entryway: the Route 46/69 arterial and Mill Street. Bellamy Harbor Park is open from morning to dusk. The park is well equipped for evening activities and hosts some citywide events during the year. The park is served by a small parking lot off of Mill Street with Rome for approximately 20 to 25 vehicles. There is additional parking nearby off Mill Street. In order to hold an event or function at Bellamy Harbor Park, a permit from the NYS Canal Corporation is needed. For information on obtaining the permit or for an application, people may contact the Recreation Department at (315) 339-7656 or the Syracuse Office of the NYS Canal Corporation, Suite 502, 224 Harrison Street, Syracuse, NY 13202-3060; (315) 437-2741 at or visit the state canal website at http://www.canals.ny.gov/. Formerly known as the City Hall Green, the park was renamed the Joseph A. Griffo Center Square. This public space hosts a variety of events annually, from the Summer in the Square Concert Series to the YMCA’s annual 3-on-3 Outdoor Basketball Tournament. Griffo Square comprises the grassy area behind City Hall between West Liberty Street and East Dominick Street. It is designed to serve the population of Rome and surrounding communities. The park is served by a small parking lot off West Dominick Street and addition parking lots off of Liberty Street, West Dominick Street as well as by both the North James Street parking garage and the North George Street parking garage. The park is a great place to hold your next special event. For information on reserving this park, contact the Recreation Dept. at (315) 339-7656. Colonial Park is located on the corner of East Dominick Street and Black River Boulevard. It provides some green space, seating and decorative lighting for the corner and provides a gateway into East Rome. The park, which is entirely passive in usage, is designed around a peripheral walkway with decorative lights with benches and planters in the middle. The parks also make use of this design to incorporate some litter receptacles. Dyett Park is a 50-acre tract of land off of Turin Road (across from Dollar General). It was donated to the City of Rome with the condition that is to remain a nature area. Currently, the park has no programmed use, however it does contain both a walking trail and a snowmobile trail. At one time, there were two lean-tos on the site as well as a fishing site between the park’s two ponds. There is no current development at the park. There is approximately 100 feet of frontage with Turin Road. The Department of Parks, Recreation & Community Activities has created a proposal to develop the facility as a natural area, complete with an interpretative center, trails and interpretative signage. The proposal would be contingent upon the City of Rome receiving grant funding for the facility. Fort Stanwix Park is a passive neighborhood park located between North James Street on the east and North Washington Street on the west. It mainly serves mainly the population from about a quarter-mile to half-mile radius. It also serves as green space for the central business district and as an entryway into the downtown Rome area. 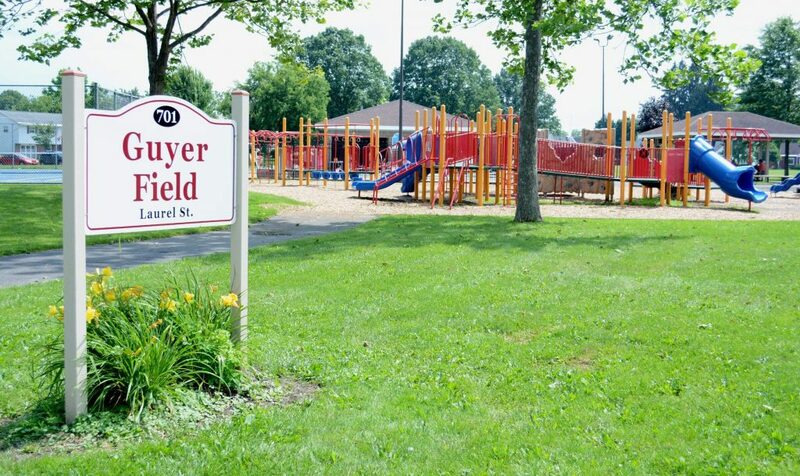 The park is within easy walking distance of several neighborhoods and has frontage along three streets, North James Street, North Washington Street and Fort Stanwix Street. It is enclosed by homes, which face the park on three sides while the fourth side is faced by businesses and vacant business property. One side of the park, the north side, transitions to housing stock without a street or other border. Given the park’s constraints, a cul-de-sac was added as part of the comprehensive park improvement plan to alleviate neighborhood and housing distress. This renovation project was an enormous success and not only led to its beautification and restoration but also significant redevelopment and renovation of the surrounding neighborhood. The park’s redesign incorporated Crime Prevention Through Environmental Design standards – and worked well to eliminate a variety of neighborhood issues, including unwanted loitering and noise. The redevelopment of Fort Stanwix Park also included major changes in landscaping and park lighting and the removal of benches—based on discussions with neighbors regarding park usage and misuse. The park’s new lighting and landscaping schemes have significantly helped reduce crime, blight and loitering in and around the park. Police calls and park vandalism have been dramatically reduced. Overall, the park remains in excellent condition and is a wonderful asset to the downtown district. The park is a tree-lined stroll in close proximity to Jervis Public Library, the Rome Art and Community Center, the Rome Family YMCA and the North James Street Commercial Corridor.